March of the Evil Ones: Story Time & Playmat Giveaway! I’m a sucker for Magic nostalgia. When I was a littler Derf Jr. circa 1996, I’d daydream about the artwork of the cards I owned. There was a mystique about Magic artwork back then: where these creatures came from, what lands they lurked in, and what treasures (or horrors!) lay within the ruins of crumbling castles and dark forests. There was no world building back then, no style guides. My imagination would fill in the gaps and run wild. Fast forward to today. I wanted to do something different for my latest playmat. I love the themes I used for the last two (Mystics and Squadron Hawks, Goblins vs. Elves), but to mix things up, the next one had to be more…cohesive. Like a united force of creatures, a mix of old and new. And I wanted to bring a different feel to the mat…darker and more mysterious perhaps. And last but not least, I wanted to revisit and reinterpret a little of that old-school nostalgia. Behold: March of the Evil Ones! The biggest challenge of this playmat was figuring out what to include. Ask yourself: what creatures do you associate with Mono Black? Tournament decks, casual decks, EDH and cube inclusions…there are so many creatures throughout Magic history that you could name. A lesser but no less considerable challenge was putting them altogether in one scene. While it would be nice to include half a dozen of the Mono Black-themed lands we all know and love, putting them into one landscape was, I felt, a little unrealistic. And some creatures are just too big-boned to include all of them, and so in true Mono Black fashion, some sacrifices had to be made. You might be wondering why I haven’t mentioned any of the cards I put into this mat. That’s because you have the chance to win one of these mats: by naming all of the cards! There are [CENSORED] cards depicted in this playmat. Email mtgderfington at gmail dot com with the Subject Line: “Playmat Giveaway” and include a list of all [CENSORED], along with your name (and Facebook/Twitter info if you have it). If you get all [CENSORED] right, you’ll be entered into a draw. 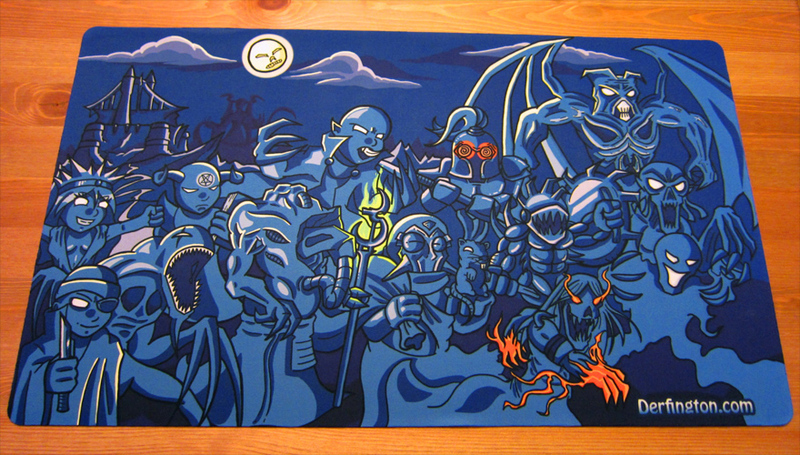 The winner will receive a signed and altered playmat!